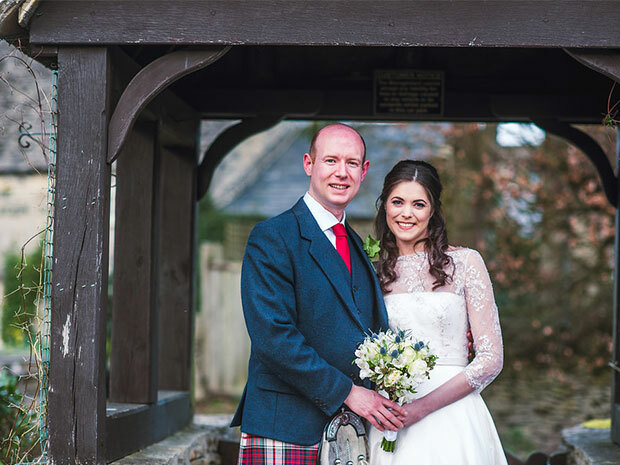 A rustic celebration at The Green Dragon Inn, Derek and Katie brought their big day dreams to life in the Cotswolds, with DIY touches and a shout to the groom's Scottish roots. 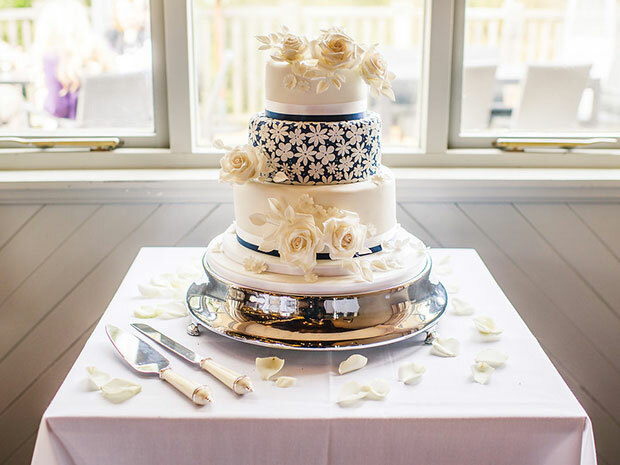 Cake: A three-tier flavoured sponge cake, prepared by the same wonderful friend who did the flowers! Katie will always claim she bought Derek off the internet after they met using online dating. Derek surprised Katie by suggesting a walk over Cleeve Hill and proposed on a bench that overlooked the village where she grew up. She had no idea! A long time, but not for the usual reasons. We were originally planning to get married in April 2017, not 2018, but some health issues got in the way and we took the difficult decision to postpone our big day to make sure that everyone was going to be able to enjoy themselves fully. That meant we technically ended up taking almost two years to plan the event, even though the reality was that most of the work was done in the space of four months between December 2017 and late March 2018! Our venue changed as a result of the delay in holding the wedding. Originally, we had planned to use a larger venue. When we postponed the day, it made us re-evaluate what was really important to us in planning the wedding. Once we realised when the revised date of the wedding would be, we decided that we wanted a smaller, more intimate setting. It would mean that the guest list would need to be smaller, but we thought it would make the overall process of organising the event easier and more personal. A friend of Katie’s recommended The Green Dragon after having been to a wedding there previously, so we got in touch with Nicky and the team and went for an initial discussion and viewing. 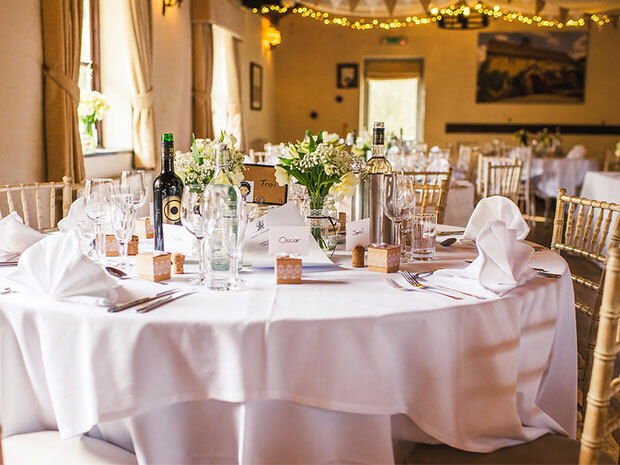 Almost immediately, we realised that we’d found what we were looking for; not only was the venue in a lovely location, but the Green Dragon team were exceptionally relaxed and flexible through the whole process. We don’t regret our choice for a minute – the staff were excellent all the way through. 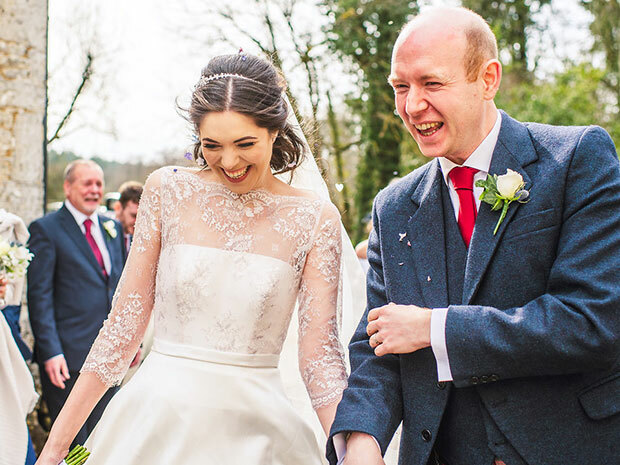 The wedding was very much a DIY affair, created by taking recommendations from friends and a lot of searching for inspiration by the bride and groom. 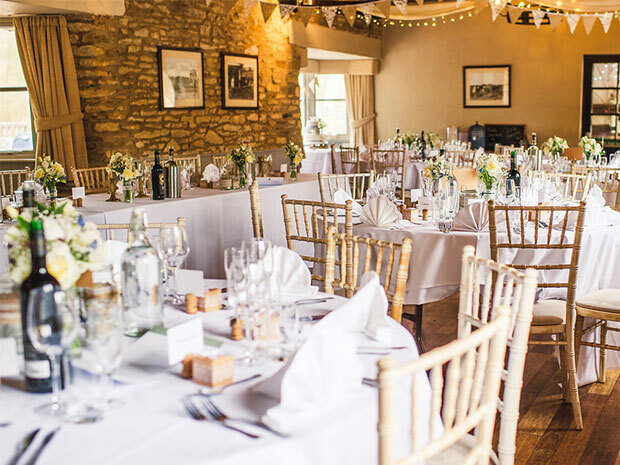 Katie’s sisters – her bridesmaids – played a huge part in helping to create the look and feel of the day, and the majority of the venue decorations were decided with their help. The day before the wedding, family and friends descended on the Green Dragon and helped to decorate the venue. A friend created the table seating display – complete with glowing lights – from scratch, to match the rustic feel of the other decorations in the room. The dress was from Sarah Elizabeth Bridal Boutique and was one of the first dresses Katie tried on. After scoffing at people who said that you would ‘just know’ when you found the dress, Katie was delighted to discover that in her case it appeared to be true. The beautiful boutique and the wonderful help and advice of the owner Sarah made choosing the dress a dream. 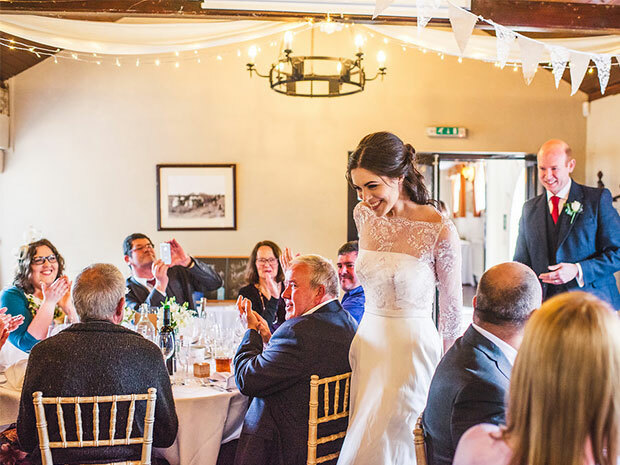 This was especially true when Sarah suggested pairing it with the delicately coloured pink/purple lace bolero making it a bit more special than a traditional plain white or cream dress. 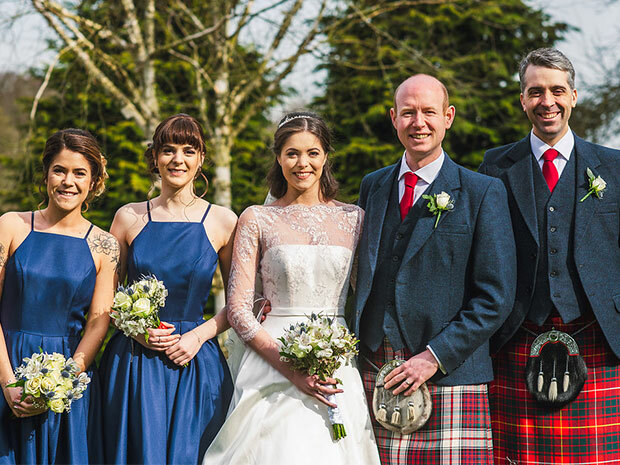 Derek is Scottish, so was only ever going to get married in his kilt. 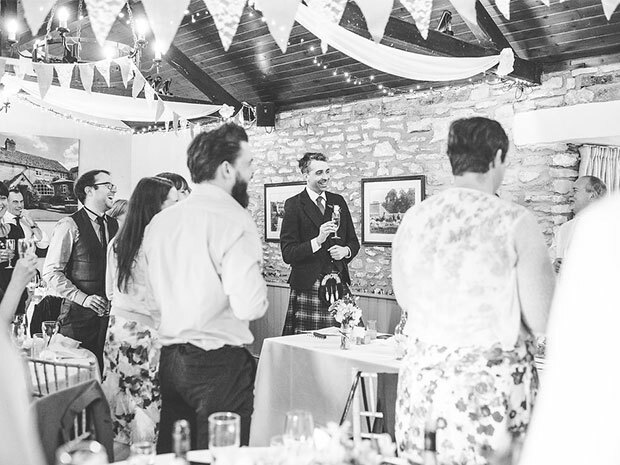 He and his Best Man were the only guests in highland dress, so immediately stood out from everyone else. Katie’s ‘something old’ was her great-great-grandmother’s wedding ring, which was loaned to her by her Aunt for the wedding celebrations. The whole thing felt like it went by so quickly – everyone warned us about that and it certainly turned out to be true. 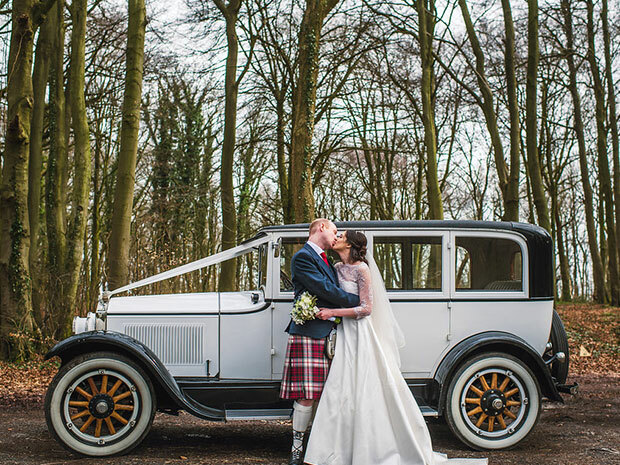 In a day full of fond memories, Derek really enjoyed the time that he and Katie got to spend together as the wedding car drove them from the registry office to the reception venue. 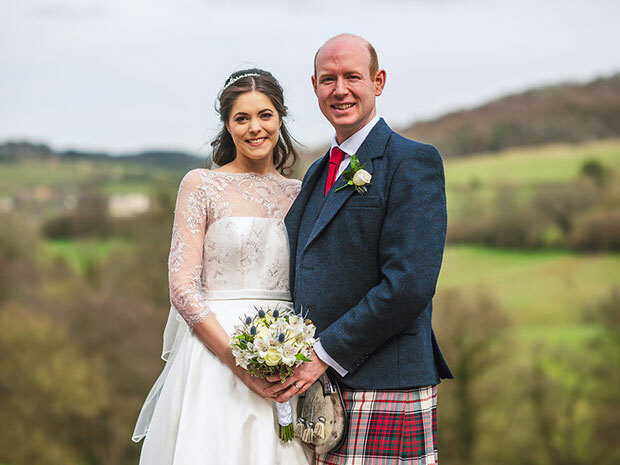 It was an oasis of relative calm in a wonderfully busy day, and the first chance for the bride and groom to share their memories of the ceremony. 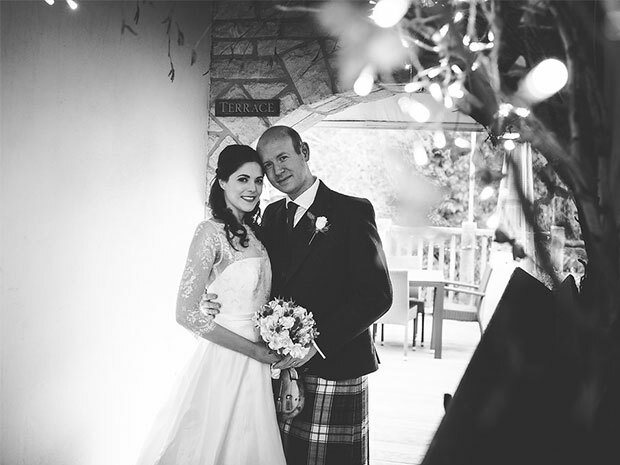 Katie’s favourite part was walking down the aisle with her Dad and seeing Derek standing at the end, smiling: both because she couldn’t wait to finally be married to Derek, and because she managed to reach the end of the aisle without falling over. We’re pleased to say that, from our perspective at least, everything on the day itself went off without any problems at all. The closest we came to a problem was on the night before, when Derek suddenly realised that he hadn’t brought his kilt socks with him! That’s not really something that you can easily cover up, so there was no option but to make a very late-night dash back to our house in Cheltenham and pick them up. That meant interrupting Katie and her bridesmaids from their pre-wedding routine, but it avoided a panic the next morning! Katie suggests getting your husband to plan it, as hers did a pretty wonderful job! Derek would recommend that people think really carefully – and most importantly, independently – about what you want from the day. There’s such an industry around weddings that it’s easy to be led by people who, even though they may have good intentions, are still trying to sell you something. Take the time to work out what you want, and then find people who will help you without enforcing their ideas on you. We took some time down in Cornwall immediately after the wedding – we love visiting Bude and the surrounding Cornish coast, so it was the obvious location for a mini-honeymoon. Our actual honeymoon is going to be a big break in 2019, though we’re still narrowing down the final location! 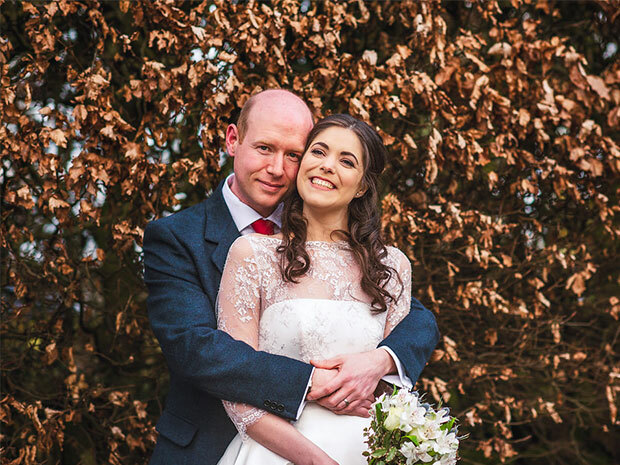 If Katie and Derek’s wedding has inspired you, call (01242) 870271, email gdbookings@buccaneer.co.uk, or visit green-dragon-inn.co.uk directly.